A new video explores the history of Emory's Department of Medicine, among the oldest departments in the School of Medicine. Dr. David Stephens on the importance of research at the Emory Department of Medicine. David S. Stephens, MD, vice president for research in the Robert W. Woodruff Health Sciences Center (WHSC), Emory University, has been appointed chair of the Department of Medicine in Emory University School of Medicine, and chief of medicine, Emory Healthcare, effective immediately. Stephens has served as interim chair of the department since July 2013 and as vice president for research in the WHSC since 2008. He also is the Stephen W. Schwarzmann Distinguished Professor of Medicine and has directed the Division of Infectious Diseases in the Department of Medicine since 1992. "David Stephens has been a tremendous leader for the Department of Medicine and the Woodruff Health Sciences Center for more than 30 years as a scientist, an educator, a clinician and a strategic leader," says Christian P. Larsen, MD, dean of Emory School of Medicine, vice president for health center integration and chairman of the board of the Emory Clinic. "He is uniquely qualified to lead Emory’s largest and most widespread academic and clinical department, and I am extremely pleased that he has accepted this new challenge as chair." As vice president for research in the WHSC, Stephens has focused on growth of multidisciplinary research across the WHSC and Emory University; development of innovative research initiatives; enhancement of research strategic themes and collaborations at Emory and among local, regional, national and international partners; and research training and career development. 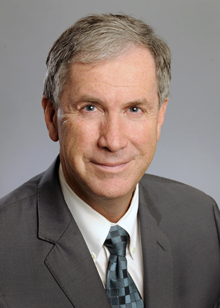 "Emory and the Woodruff Health Sciences Center have been fortunate to have David Stephens as a strategic research leader at all levels," says Wright Caughman, CEO of the WHSC, Emory executive vice president for health affairs and chairman of Emory Healthcare. "As a researcher, educator and physician, he is uniquely qualified to focus his experience and broad understanding of academic medicine on the exceptional faculty, clinical quality and research vision of this outstanding department." Stephens joined the Department of Medicine faculty in 1982. He has led the development of successful programs in infectious diseases and microbial pathogenesis and has been a major contributor to the creation and development of the NIH-funded Emory Vaccine Center and the Emory Center for AIDS Research. He is principal investigator for the Atlanta Clinical and Translational Science Institute (ACTSI), a multi-institutional research and clinical trials partnership funded by a Clinical and Translational Science Award (CTSA) from the National Institutes of Health (NIH), first in 2007 and refunded in 2012 for a total of more than $60 million. Stephens is professor of microbiology and immunology in Emory School of Medicine and professor of epidemiology in Emory's Rollins School of Public Health. He is chair of the Research Advisory Council in the WHSC and a member of the Executive Committee on the WHSC Leadership Team. Stephens joins a distinguished roster of chairs who have joined the Emory University School of Medicine in recent years, including Mark Rapaport, MD, chair of the Department of Psychiatry and Behavioral Sciences who joined Emory from Cedars-Sinai and UCLA; Laureen Hill, MD, MBA, chair of Anesthesiology who joined Emory from Washington University School of Medicine in St. Louis; and Martin Sanda, MD, chair of the Department of Urology who joined Emory from Harvard earlier this year. After receiving his MD degree from Wake Forest University School of Medicine, Stephens conducted research at Walter Reed Army Medical Center and the NIH. He completed his clinical training in internal medicine and infectious diseases and a research fellowship in microbial pathogenesis at Vanderbilt University School of Medicine. His laboratory is an international leader in efforts to define the molecular basis for virulence and vaccines to prevent bacterial meningitis. He has contributed more than 240 publications in infectious diseases, molecular pathogenesis, epidemiology, vaccinology and immunology. Stephens is a member of the Association of American Physicians, a Fellow of the Infectious Diseases Society of America and has served on NIH, Veterans Affairs, Centers for Disease Control and Prevention (CDC) and Food and Drug Administration (FDA) review panels. He was chair of the FDA National Vaccine Advisory Committee, a liaison member of the Health and Human Services National Vaccine Advisory Committee and a Senior Scientific Consultant to the Meningitis and Special Pathogens Branch at CDC. In 1988 Stephens co-founded the Atlanta Active Surveillance Project (now the Georgia Emerging Infections Programs), a population-based surveillance and clinical research program. In 2001 he led CDC's clinical emergency response team in defining clinical issues in prophylaxis, diagnosis and treatment of B. anthracis infections. Stephens has served as the site principal investigator (PI) for multiple NIH RO1 and other federal grants including the NIH-sponsored Southeastern Regional Center of Excellence for Emerging Infections and Biodefense, the CDC-supported Southeastern Center for Emerging Biologic Threats, and the NIH-funded Exploratory Center for Interdisciplinary Research in Vaccinology. The infectious diseases program he directs has graduated more than 120 fellows, and his laboratory has trained 88 infectious diseases fellows, postdoctoral fellows, medical students and undergraduates in bacterial pathogenesis and infectious diseases epidemiology. He has served as the thesis advisor for nine PhD, MS or MPH degree candidates and has served on 24 PhD graduate committees in microbiology, microbial genetics and epidemiology.